"I baked the memories back to life," Marcy says about her three-year project to collect and write about the recipes from her father's bakery. "I wanted the recipes and then I wanted the story," she said. "I've been baking for two years, but the story has been there gestating since I left home at 17 and left all those good things behind. The project came out of a selfish desire to taste those things again." Marcy's father, Max Brenner, owned and operated Brenner's Bakery in Alexandria, VA for 43 years. Brenner's offerings included cookies, bread, pies, pastries, doughnuts, and cakes. Marcy's dad died in 2017, but he knew and was happy that she was working on collecting his recipes and stories. She also enlisted the help of her niece and nephew; her nephew, Jason, had worked in the kitchen of Brenner's with his grandfather and knew a side of the bakery business that Marcy hadn't experienced. (It was segregated by gender – the men baked and the women ran the front of the shop.) Recently, Jason honored his work at Brenner's by naming his baby son "Baker." Marcy is working on the final edits for "A Baker's Daughter" now, and hopes to go to press with it "before summer." 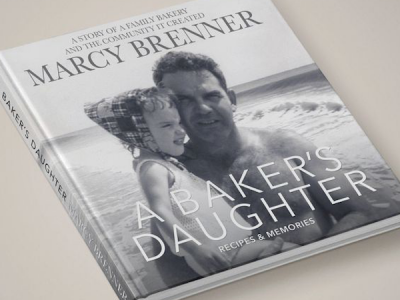 The book will include 50 Brenner's Bakery recipes, illustrations, photos, and stories. Her editor, Kristin Donnan, is one of Marcy's oldest friends (since age 14) and has her own fond memories of the bakery. "I showed her what I had, and she wanted to edit it," Marcy said. "She helped me to organize all the material, and she's good at asking questions and drawing stuff out of me, going to the next level. I like collaborating; the story was in me, but it needed midwives to get it out." The book is structured by category of recipe (bread/cookies/cakes/pies, pastries, doughnuts/random favorites) and each section has a story. The chapter she titled "Bread and Water" is about her grandfather, who escaped Jewish persecution in Poland and ended up in Norfolk, VA, where his brothers had emigrated before him and opened a bakery. Her grandfather delivered the Brenner bread by horse and buggy in the Tidewater area. Baking is genetic for the Brenner family. One of Marcy's great-uncles opened a Brenner's Bakery in Arlington, VA, and another went to Seattle and opened a Brenner's Bakery there, too. And her dad, Max, started his own in Alexandria in 1953. Other sections of the book describe Marcy's memories of the bakery, and stories of her dad, mom, and sisters. Her dad's chapter is "The Whistler" – Max was known for whistling while he worked. Marcy believes it was his self-soothing technique, the way he stayed calm while facing that mountain of dough each morning at 3am. Marcy says that her main mission was to "trust the recipe." She tried to change some ingredients (e.g., using butter instead of shortening) and learned that it just didn't produce the tastes she was craving. So she stayed true to the original, feeling that she was guided by her father and grandfather. "When I was baking, I'd go outside just so I could come back in and smell it again," she said. When she started the project, she thought the audience would be small – mostly fans of Brenner's Bakery who've commented on the Facebook page she created to ask customers to share their memories. But the collection of recipes grew into a family story, and Marcy hopes it will resonate with readers beyond the Brenner's circle. Now that she's deep into the final edits, Marcy says, "I think the book will be fun for people; it's a book about food and family with good recipes." Marcy of one of the guest speakers at the annual Friends of the Library meeting on Thursday, March 21st. She will be reading the introductory chapter of "A Baker's Daughter." She's also bringing cookies! She's baking oatmeal chocolate chip, oatmeal raisin, and the famous iconic Brenner's cookie: a butter cookie with "a big swirl glob of chocolate fudge icing." Yum! Marcy and her husband, Lou Castro, create music as the duo Coyote, and host live music events in the Coyote Music Den in Ocracoke's historic Community Square. Learn more at www.coyotemusic.net.